The area high school girls soccer teams are entering the upcoming season with two different mindsets: rebuilding and success. Some teams are looking to simply improve upon last year, while others are planning on being serious contenders in their respective classes once again. Berlin, Southington and Innovation are all coming off successful 2017 campaigns and this season should be no different as they hope to continue their success. The Redcoats are looking to make their way back to the Class M state final and this time, not leave as the runner-up. The Blue Knights and the Ravens both have lost some key playmakers but also has a number of returning talent to have a successful season. Newington, meanwhile, is also looking to make it back to the postseason with Plainville attempting to get over the hump and into the state tournament. New Britain, on the other hand, is trying to make strides in the right direction as a program, but has trouble with that in the past. Outlook: The New Britain girls soccer team is coming off a season that didn’t go as well as it had hoped. But the only direction the Hurricanes can go is up. The good news is New Britain didn’t lose many of its key players, even if they were important and helped them remain competitive in some of the team’s matches. With that, the Hurricanes will look for this season to be about continued growth. Many of the girls have only played recreational level soccer and are competing against towns with established and effective feeder programs. The program’s only player who has that experience is Maya Mlynarska. She is expected to lead the team this season. This season could be an interesting one for the Hurricanes. Outlook: The Redcoats are coming off of a Cinderella season. Then No.2 0 seed when then Class M state tournament began, Berlin made it through five rounds, including knocking off top-seeded Lewis Mill, to reach the final. The Redcoats had great leadership last season and that should carry over into this season, which should help with yet another coaching change. This is the third year in a row Berlin will have a new head coach. Alex Joslyn, who spent three seasons as an assistant with the boys program, will be taking over for Katie Amenta. 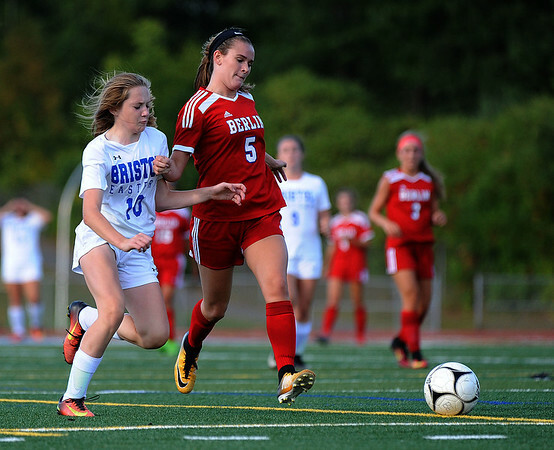 The Redcoats also bring back the majority of its core from 2017, although the loss of All-State midfielder Julia Sisti will be a big loss. Overall, Berlin is an athletic squad that should be able to match up well with most teams in not only the CCC, but the state. It will also help that the Redcoats look like they will have quite a few young players to mix in with the veterans. Freshman midfielder Kyle Gentile is expected to contribute and junior defender Maria Butrimas will also be returning from the field from a season-ending injury. If Berlin is able to carry over some of its momentum from last year, it could be another successful season for the program, new coach or not. Outlook: The Indians finished the regular season in 2017 with a .500 record and head coach Adam Wilkinson expects much of the same this year. The good news is Newington has a few key players returning it can rely on such as senior midfielder Abby Malloy. Last season she led the team in assistants and was a junior captain. Senior forward Zoe Walk and sophomore forward Olivia Mullings are also expected to contribute. One thing to watch out for this season for the Indians is their defense. Newington has an entirely new defensive backline with the loss of Skylar Couillard being the main one. Its strength this year will be its creativity though its midfield and speed on attack. Outlook: The Blue Knights are coming off one of their most successful seasons in recent memory, having made it past the first round of the state tournament for the first time since 2008. Southington ended the year with a 12-4-2 record and while it’s looking to build off that success will have to replace a number of veteran players after losing 10 seniors, six of which were starters. Despite the losses, the Blue Knights are optimistic about the upcoming season. The incoming group will be young but extremely talented according to head coach Michael Linehan. Leadership from the returning players and team chemistry will also be some of the keys to their success. Southington will be returning its starting goalkeeper, Olivia Sherwood, who had 11 clean sheets last season, as well as All-State and All-CCC center back Alijiah Vega. Outlook: Plainville struggled at times last season, with its biggest problem the inability to consistently score goals. Out of the 16 games played, the Blue Devils were shut out in seven of them. Some of that was due to having a young roster than most in their league. But that also means Plainville will bring back a number of players who were able to get some valuable experience and use that to try and help the team grow over the season. Plainville might not be at the top of the league this upcoming season, but a better record certainly seems like a real possibility. Outlook: The Ravens are coming off their third consecutive regular-season CRAL title and another postseason appearance, meaning the team once again has high expectations entering this season. Despite losing eight players to graduation, including All-State forward Victoria Piechota as well as Kelsey Walicki, Innovation returns a solid core from last year’s squad, including five seniors with plenty of varsity experience. There are still several key positions that have yet to be filled and will need to be if the Ravens hope to continue their successful run, but several underclassmen and newcomers are already stepping up and should provide quality minutes to fill the void. A tough out-of-conference schedule should help prepare them for the playoffs as well. Posted in New Britain Herald, Berlin, Goodwin Tech, Innovation, New Britain, Newington, Plainville, Southington on Tuesday, 4 September 2018 21:09. Updated: Tuesday, 4 September 2018 21:12.